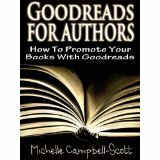 Goodrea ds for Authors: How to Use Goodreads to Promote Your Books by Michelle Campbell-Scott. 178 pages. This was the book that I added to the mix, simply because I was already on Goodreads (make sure you look me up if you are too! ), and I have heard for a while that Goodreads is a great place for authors to connect with readers. Although the book did offer some helpful advice, much of what the book provided, and much of its 178 pages was spent on simply acquainting the reader with what Goodreads is and what features it offers. I already knew that, so I ended up skimming over that part. What did catch my attention was a couple of facts that I wasn’t aware of: that the Giveaway feature can be used even if your book isn’t new. She recommends you give away as many books as you possibly can. In fact, that was a theme that came up over and over again in all three books: give away stuff to your potential customers. In addition, this author recommended an approach toward advertising on Goodreads that was helpful to me. She suggested that you split your advertising into two campaigns: one directed at readers in your genre, and a second one directed at those who follow other authors in your genre. It made a lot of sense to me, but overall, I didn’t feel there was a lot here for me. I give her three stars out of five. 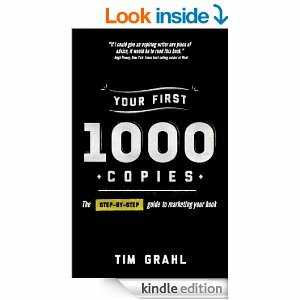 Your First 100 Copies: The Step-by-step Guide to Marketing Your Book by Tim Grahl. 147 pages. While Michelle Campbell-Scott’s book resulted in two bits of advice I could use, Grahl’s book was a lot more useful and resulted in a half page of notes. Most important of these were two items: the value of a manifesto, and the value of providing a newsletter. A manifesto helps the author consolidate what he or she believes and what the purpose of their writing is. It also is a venue for them to share with their potential audience who they are and what they are trying to do. It struck a chord with me because I am in the process of trying to find one road to follow, instead of many. The newsletter was a new idea, but it was mentioned in my third book as well. The idea is that social networks, websites and blogs are there to drive potential readers to the newsletter, and the newsletter is there to sell them on your books. The benefit of doing it that way is that readers elect to subscribe to your newsletter, and because they do, they are willing to hear more about what you are trying to promote. There was a lot more ideas that came out of this book–like I said, I wrote half a page of concise notes–but I won’t share them here. Instead, get your copy of the book. Final grade: four out of five stars. 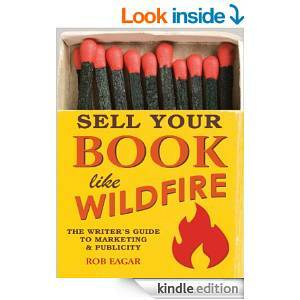 Sell You Book Like Wildfire: The Writer’s Guide to Marketing and Publicity by Rob Eagar. 280 pages. Where the Goodreads book offered two bits of advice I could use, and Your First 100 Copies offered a half page, I ended up writing down two full pages of concise notes from reading Eager’s book. There was a little bit of redundancy with the first two, such as the recommendation of having a newsletter, but for the most part Eager had lots to share that was worthwhile to me. His emphasis was on value, and what made it a little bit confusing to me was that he used it two ways: first, to show the reader that they spent their money wisely, and second, to express the values of the author. At least that’s how I took it. He talks about the author writing a value statement, which is slightly different than a manifesto, in that it shares what you are offering readers that they can’t get anywhere else. I took that to mean both definitions of value. He emphasized giving stuff away, in many cases, free copies of your book. He said something that I have heard multiple times in marketing circles, and that is to not talk about your book. Instead you should be talking about the values you promote in your statement. Finally, while the second book talked about the need for a newsletter, this book took it a step further and told me what should be going in that newsletter (what I was really wondering). It went on to make recommendations on how to make a more results-oriented webpage (which is helpful) and public speaking (not so much). He completes his book with a chapter on how to promote fiction (bingo!). I give him five out of five stars: he missed a couple of times, but made up for it with lots of helpful information. Finally, I need to add the disclaimer that what was valuable for me might not be valuable for you, and vice versa. But there are literally hundreds of books on book marketing, and I know how tough it is to find the one that works best for you. My advice is to jump in, skim through one or two if you need to, and pick and choose advice. Good luck.